Recombinant protein expressed in bacteria. Our Abpromise guarantee covers the use of ab39374 in the following tested applications. ab39374 staining Peripherin in Human spiral ganglion tissue sections by Immunohistochemistry (IHC-P - paraformaldehyde-fixed, paraffin-embedded sections). Tissue was fixed with paraformaldehyde, permeabilized with Tween-20 and blocked with 1% BSA for 30 minutes at room temperature; antigen retrieval was by heat mediation in citrate buffer, pH6.0. Samples were incubated with primary antibody (1/250 in PBS-T + 1% BSA) for 12 hours. An Alexa Fluor® 488-conjugated Goat anti-chicken IgY polyclonal (1/500) was used as the secondary antibody. Ab39374 staining human peripherin in neonatal rat cortical neurons cultured for 14-21 days by ICC/IF. 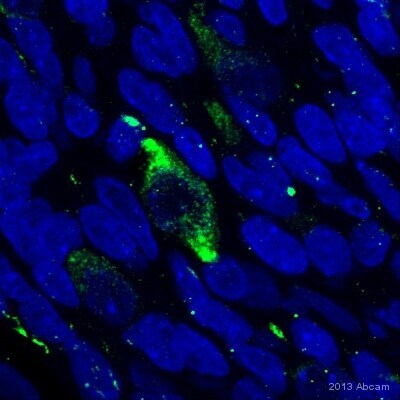 Immunohistochemistry (Frozen sections) - Anti-Peripherin antibody (ab39374)This image is courtesy of an anonymous abreview. ab39374 at a 1/100 dilution staining Peripherin in rat brain tissue (cerebellum) by Immunohistochemistry (PFA fixed, frozen sections), incubated for 12 hours at 4°C. Permeabilized using 0.3% Triton. Blocked with 10% donkey serum for 1 hour at 22°C. Secondary used at 1/500 polyclonal Goat Vector BA 9010 conjugated to biotin. Biotin detected with streptavidin Alexa Fluor 594. 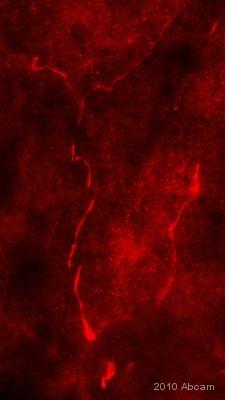 The image shows a climbing fiber in the cerebellar molecular layer. Publishing research using ab39374? Please let us know so that we can cite the reference in this datasheet.